The slim hopes of making next season’s Champions Cup hang on this Friday’s trip to Wales. CONNACHT DEFENCE COACH Pete Wilkins believes it’s win or bust for the province on Friday when they clash with fellow Champions Cup chasers Ospreys. 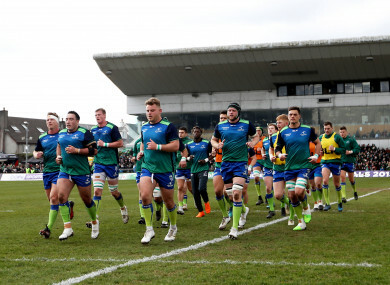 Connacht’s 33-28 defeat at the hands of Gloucester last weekend dumped them out of the Challenge Cup at the quarter-final stage, but it also put them further out of reach of the remaining spot for top tier European rugby next term. The 2016 champions are desperate for victory at Liberty Stadium this weekend but still need things to go their way elsewhere after three defeats in a row. “We have been blunt with each other. The really positive thing about this group of players is that they are very honest. It’s been a positive talk but with the realism that we let ourselves down,” said Wilkins. “It really would show the character of the side to go and win in Ospreys now. And it wouldn’t surprise me. “If there is a group of players that is determined against the odds to go away and get results, it’s this group. We have got every faith. Tighthead prop JP Cooney is the latest Connacht player to announce his departure from the province before next season as coach Kieran Keane puts the finishing touches on his 2018-19 squad. However there are still incoming players yet to be announced and Wilkins says versatile out-half David Horwitz will be a great addition when he is expected to arrive at the end of the Super Rugby campaign. “He is contracted to the Rebels at this point and we look forward to seeing him this season when Melbourne are done,” said Wilkins. “He has been a bit unfortunate because he played every game but one for the Waratahs the previous year. And had Australian out-half Bernard Foley ahead of him, so he was mainly filling in at 12 as a second playmaker. “He is a 10 by trade. I would imagine that part of his motivation to go to Melbourne was the opportunity to play at 10. “Unfortunately it coincided with a large amount of players arriving from the Western Force and the player pool changing as a result. Email “Connacht take aim at Ospreys determined to keep the season alive”. Feedback on “Connacht take aim at Ospreys determined to keep the season alive”.